Welcome to week 1 of our featured Stamp of the Month Escape the Ordinary. 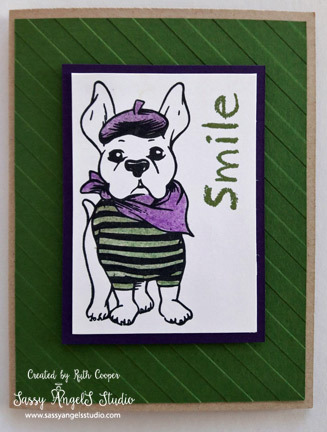 I will be featuring a new card design each Monday. Don’t forget to check out the August 1st post for the link for the free download tutorial of the bonus project. For this week’s card I did a side cut out using the umbrella image. It can be a little challenging to do but with a few tips you can create a side cut in no time. Let’s take a closer look at the card. I popped onto my video program & did a short video close up. This video stuff is still kind of new territory so I am trying to see what I can do or not do successfully. For all the creating I do, my technical skills are minimal and it takes a bit for me to learn. When deciding to do a side cut, you’ll want to first determine how many times the image can be repeated down the side of your card. 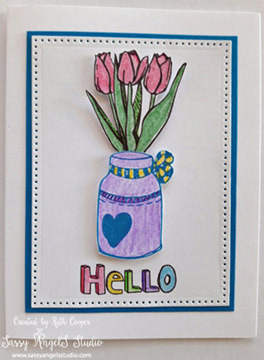 I would practice on a card sized scrap first before working on your actual card. For Be You, I decided 3 would work. I took 5.5 inches, divided by 3 and came up with 1.8 and marked the card at 1 7/8″ from the top & bottom of the card. Then I angled the umbrella in the direction I wanted & stamped using my Create-A-Palette. I found stamping the bottom image first gave me a better spacing guide. I did use a small mask to keep the umbrella handle from overstamping the previous image. Then you need to decide how much of the edge of the image you plan on cutting away to give you a cut edge. With this image going from edge to handle was perfect. If you haven’t done this before give it a try sometime. Here are the card basics: Whip cream card 4 1/4″ x 5 1/2″ with a Catalina Splash insert 4 1/4″ x 5/12″. 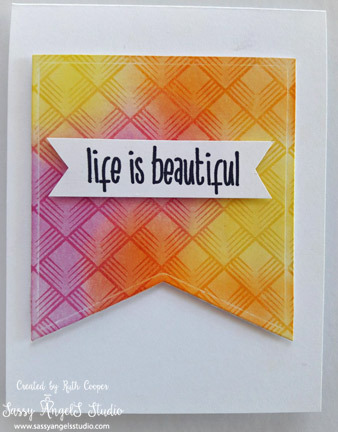 Create-A-Palette inked with Liquid Color in Watermelon Fusion, Lavender Fusion, Cool Pool, Limeade Splash & Catalina Splash, sentiment embossed in my custom mix black embossing & Sparkle Dust mixture. Card base sprinkled with Sparkle Silk. I hope you like this fun and cheerful card. Hi Angels! It’s SASS time at the studio! Today’s card is a baby card I created for my Chiropractor & his wife. After many years of waiting, they were finally blessed with an adorable baby girl. Isn’t the little elephant cute? It was a joy to create such a fun card. I want to address something. 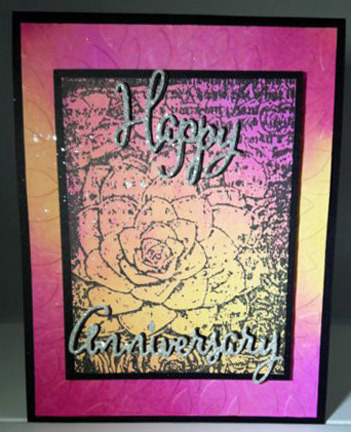 As most of you know I am a Fun Stampers Journey Coach which means I sell FSJ products to my customers but you can obviously tell by this card that I used a couple of other products on it. Why would I not use all FSJ? Well quite simply I have been creating for well over 30 years now. I have a huge variety & I love creating with diverse techniques & products. Most of the time my creations are designed from a vision I see in my imagination. Sometimes inspired by another artist’s creation that I truly like, I do CASE usually with a twist but 90% of the time it comes straight from my mind. Being able to “dig” through my stash, gives me a huge variety to make my vision into art and a wise use of the resources I already own. I also believe this is a valuable gift from God & it’s my joy to share creativity with everyone, especially as encouragement. 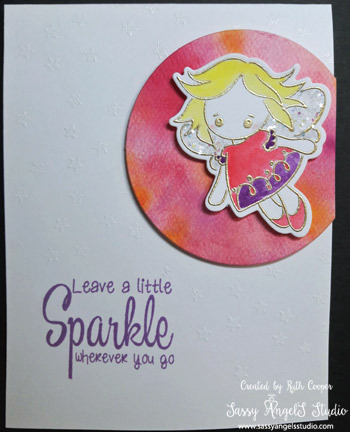 I love my Fun Stampers Journey products. They form the base of all my creations. 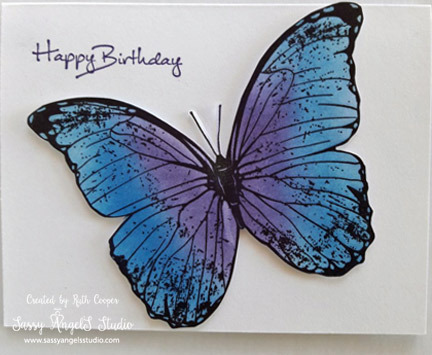 A terrific color line of paper, inks & mixed media products, fabulous adhesives, a wonderful selection of dies, punches & stamps. I love the quality of all the products & the consistency in the colors throughout the color line. This quality allows me to create knowing my colors match beautifully. 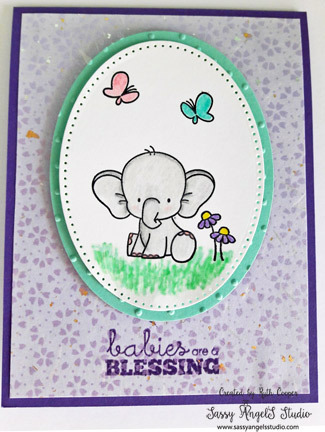 The things I use over & over again, like the ovals in this baby card, or my adhesives, allow me to create wonderful quality pieces of art. There is one more important reason to use a variety to create. There was a statistic shared at CHA that 10 years ago there were over 2700 independent stores across America & Canada, now sadly there are just 340. Several more manufacturers & other small businesses have closed not reported in this statistic. Several of the art business I purchase from are small just like me & my FSJ business. They support their local economy, just like I do. They work from their homes, small offices or store fronts. It’s important to support small business & the arts community. Because the big box stores decided they had to feature their own craft lines a few years back, you don’t see the rich diversity of what’s available on the market if you always shop with them. They have become cookie cutter to me, copying the latest trends in their own brand name so they reap more of the profits & often offer poor quality supplies. It’s a struggle for all art businesses in our current economy but it’s a bigger struggle for the smaller companies & home businesses. I am a local small business. This is not only my business but my ministry. 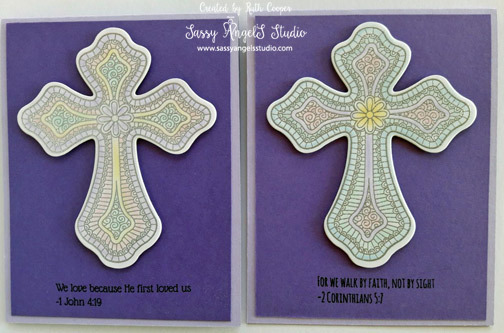 I offer classes & the Fun Stampers Journey product line for ordering. 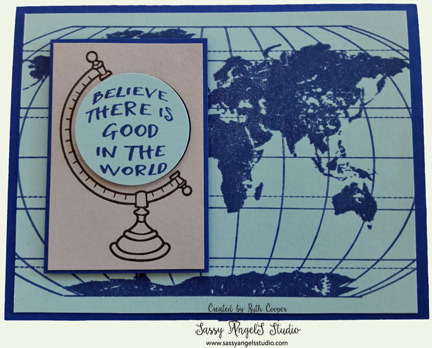 I believe Fun Stampers Journey has the perfect mix of products for stampers, scrappers & mixed media artists. My club is exclusively FSJ & about 90% of my classes are FSJ exclusive. I share my expertise with everyone who loves to create. 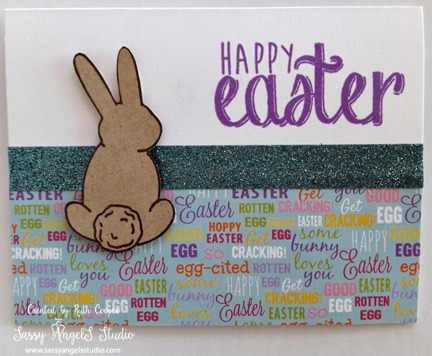 At the SASS studio you can relax, enjoy creative time, make new friends, learn new tips & techniques & bless others by helping to create cards for our Troops & our local Salvation Army Angel Tree program. I also hope that by sharing different things from time to time it inspires you to see what you already own in a new creative light. Live big, support small, enjoy creating & share with others. 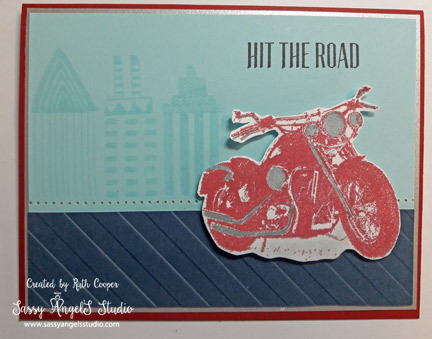 Welcome to the very 1st Journey Blog Hop featuring Fun Stampers Journey products & inspiration! If you arrived from Rachael Shedeed’s blog, you’re right on track. If not, just keep hopping & you will see all the wonderful artwork in store for you today. The theme for this hop is Valentine or Love creations. I like to make multi-purpose cards that can be used for multiple occasions, so I made a “Love” card. 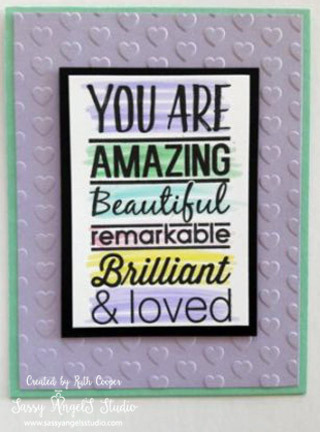 This card can be used for Valentine’s, Anniversary or just to say “Love You”. I enjoy mixing up colors & this card is anything but the standard “love” colors. The card base is Cool Pool, layered with Pretty Amethyst, stamped in Pretty Amethyst Fusion Ink with the Whimsy Wallpaper background stamp. I then cut the largest oval with the Journey Ovals Dies & used the coordinating piercing die for some interest. 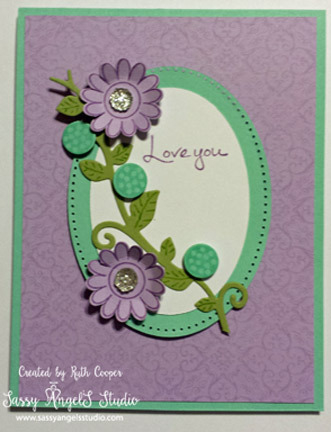 I cut the next oval size down in Whip Cream & stamped “Love You” from the Sentimental Prints stamp set in Grape Fusion Ink. 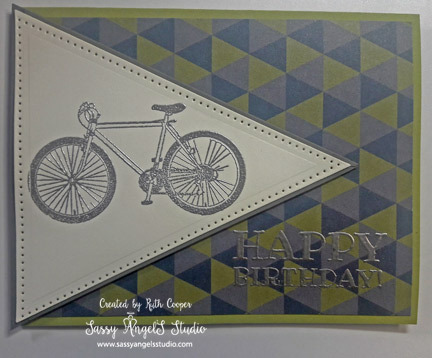 Layered these together & popped them on the card with medium Journey Foam Squares. For the flowery details, I took Lemon Grass & cut out the vine border from the Border Details set. Played with its placement on the card & trimmed & attached. I added in a bit of detail to the leaves with a basic green marker. I stamped the flowers from the Sweet Today stamp set in Grape Fusion ink onto Pretty Amethyst paper. I die cut the flowers with the matching die set & then took my Details Pro Shears & trimmed the flower lines a bit deeper to shape the flowers a bit easier. For the circle flowers I stamped the small circle from the Sweet Today stamp set in Cool Pool fusion ink onto Cool Pool paper. I didn’t want a huge border around the circle flowers so I used the circle from the exclamation point die in the Seriously die set to cut out my circles. The Pretty Amethyst flowers are mounted flush on the card, the Cool Pool flowers are popped using the small Journey Foam Squares. I added medium Sparkle Drops to the flower centers to finish off the card. I hope you enjoyed visiting my blog today. Please head over to Kathy Dowbenko’s blog to see what she has to share. If you get lost, the blogroll can be found here at Susan Berg’s blog.